We finally found someone to fix the barn roof that has experience and helpers. It's going to take 52 pieces of 14 foot long 26 gauge tin to get the job done. Our new guy thinks it will take him and a co-worker 3 or 4 full days. We agreed on 1800 dollars, and he offered to have him and his guys carry back the tin through our flood plain if we can't figure out a mechanized way of doing it. I asked him how much he needed up front and I was relieved when he said 25 percent the first day. I once paid a guy to build a cinder block fence in Las Cruces, New Mexico and learned the hard way that motivation levels can vary when it comes to finishing a job. Roofing is a LOT like work. Those guys will be earning their pay that day. Any big plans for the barn after the roof is on? We don't have one here but I'd sure like one for keeping livestock. This spring I am going to enlist the help of a few goats to knock down stuff out in our timber. It would be nice to have an old barn to get them in out of the weather and offer protection from the predators. 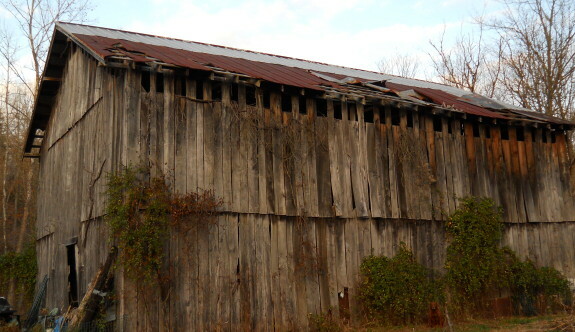 Was the barn repair on your 10 year list? we don't have any immediate plans to use the barn for livestock. At first it will be to get a handle on organizing some tools and supplies, and in the future we are thinking of building a small studio loft/guest room. The barn repair has been on our minds since we got here but we were afraid to put it on the 10 year list due to the high cost. Good luck with the goats, I'm sure they'll appreciate some sort of shelter when it rains, which could be hobbled together from old pallets for very little money. That seems like a really great price, especially for 4 days of work. When I had a much smaller roof done (one level, 3 pitch) it took 1 day and $2400+ and no rivers to cross, but I am here in Canada and our prices are always high :(. That was in another Province though. Where I live it would probably have been 2-3x more. Those metal panels are very, very sharp. When the roofer opened them up, not being as careful as he might be, he cut his leg and had to go to the ER right away. Thankfully, he was okay but had to get stitches. Just be careful if you move any of them. Mark and Heath --- Actually, it was on the 10 year list: "Barn roof replaced so that barn can be used for tools, food storage, and animals. A loft in the barn built for guest housing in summer." Heather --- We have to buy the tin and materials too, of course, but I think we'll be able to do it all for the $4,000 I'd budgeted. Good tip about the sharp panels --- we certainly don't want anyone getting hurt! OK, got it, that's just for the labour. Sounds great. Good luck with it all. Did the roof repair ever get completed?